MSD RPM Shift Light UNIVERSAL - Pann Auto Performance - San Diego largest aftermarket automotive performance parts - What do you drive? 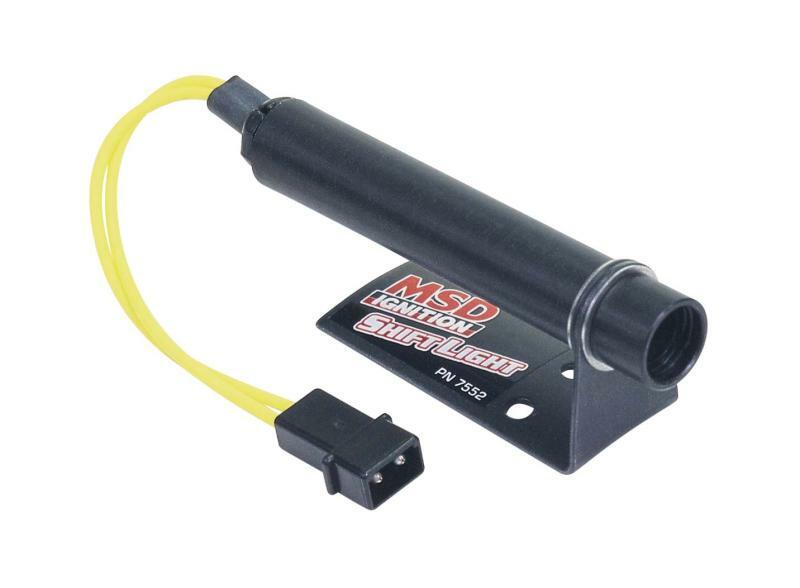 MSD LED Shift Light – Part# 7552 – This compact new Shift Light features a bright LED that will alert you to shift your desired rpm point. The small Light fits neatly to a steering column or on top of a dash board and stays unobtrusive but illuminates bright enough to see easily in the daylight. This Light has two wires that plug directly into MSD’s line of Programmable Digital Ignition Controls. It can also be used with factory or other aftermarket ignition systems through an RPM activated switch such as MSD’s PN 8950. Available in Yellow, Green and Blue. MSD Shift Light – Part# 8952 – The MSD Shift Light will turn on to “remind” you to shift when the engine reaches your specified rpm. You select the rpm using the same plug-in modules that are used with your MSD Soft Touch Rev Control. The Shift Light features a bright cluster of LEDs (light emitting diode) making it easily visible, even in bright daylight. The light will also turn on for a second or two when the ignition switch is first turned on to inform you that the light is functioning properly. The Shift Light will work on 2, 4, 6 or 8-cylinder engines and will plug directly into the tach output on MSD 6, SCI, 7, 8 and 10 Series Ignitions or can be connected to the negative coil terminal when used with points or inductive-type ignitions. The MSD Shift Light is 4 ½”L x 3 ½”H with a 1½” diameter lens. No rpm modules are supplied. Digital Shift Light – Part# 8963 – The most universal and easy to use shift light available! Our new compact Digital Shift Light can be installed on everything from 1-cylinder points triggered engines to Modular Ford engines with coil-on-plug technology. The tiny digital controller inside the compact housing gives you the ability to program the rpm activation points through the easy to view LED panel and two programming buttons.When the engine reaches the activation rpm, the six red LEDs illuminate bright enough to alert your senses into rowing the shifter at the exact rpm. You can even program up to four different rpm values for different gears! The DSL can be installed on single cylinder engines up through 12-cylinders on stock ignitions or high powered aftermarket systems.